You're here » Home » Marketing Strategy » What’s New in Marketing? According to the survey, 54% of respondents indicated that their businesses currently have websites. Regarding website features, 80% of websites include general business information, while customer service (45%), lead generation (35%) and e-commerce (30%) features trail in at a distant second, third and fourth places. A mere 13% of businesses reported having a blog. 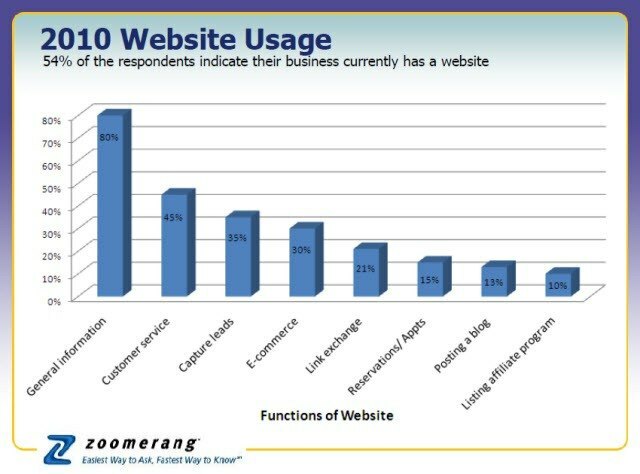 The survey indicates that there is large room for improvement among small business websites, including the addition of more value-added features, such as online shops, reservation systems and relevant content via corporate blogs. We see this as an opportunity for small businesses with brochure-like websites to progress into the 21st century with more useful and better designed websites. 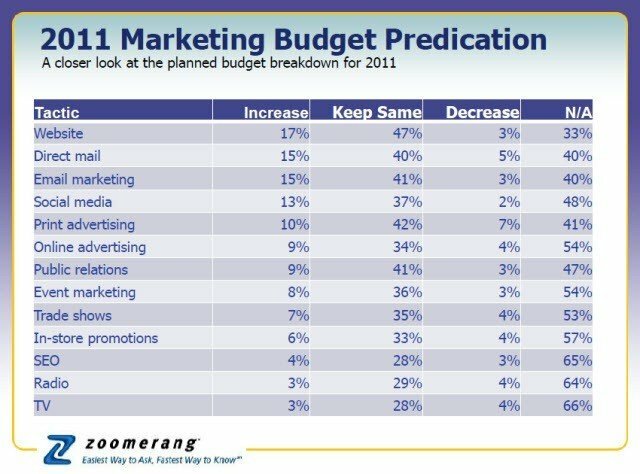 Social media is predicted to be the third most increased area for online marketing spending next year. Among the more than 750 businesses surveyed, 34% indicated that they currently engage in social media marketing. Of those using social media, Facebook (80%), LinkedIn (37%) and Twitter (27%) were the most commonly used platforms. The beauty is that all of these advancements are materializing, even on low budgets. The majority of respondents (55%) reported having marketing budgets of less than $1,000, while an additional 20% of respondents reported budgets of between $1,000 and $9,000. With low budgets, small businesses seem to be making the most of the web and its low-cost marketing opportunities. Headline: What’s New in Marketing?